AP/Tony GutierrezTexas Gov. Rick Perry. Texas Gov. Rick Perry (R) is reportedly wooing influential donors as he begins building the organisation for a potential 2016 White House bid. According to Politico, Perry plans to meet with hundreds of key GOP donors, operatives, and party officials next month. These sitdowns will begin next week with meals at the governor’s mansion in Austin and policy briefings at the office of Perry’s top campaign advisor, Jeff Miller. Perry will need to convince donors he is a viable option after his 2012 presidential bid ended early following disastrous debate performances and disappointing fundraising. Perry has blamed a lack of preparation and back surgery he had just prior to the campaign for his poor showing that year. Another potential obstacle to a Perry candidacy are criminal charges accusing him of official abuse of power that were made earlier this summer. Perry has described the grand jury indictment against him as “partisan political theatrics” and predicted it would not hamper him in the 2016 Republican primaries. His political action committee has even released t-shirts with his mug shot casting the case as a Democratic witch hunt. With his donor outreach underway, Perry joins three other Republicans, Sen. Rand Paul (R-Kentucky), former Arkansas Gov. Mike Huckabee, and Sen. Ted Cruz (R-Texas), who have taken serious steps towards launching 2016 campaigns. Both Cruz and former Florida Gov. Jeb Bush are potential problems for Perry as they draw from the same Texas donor base he is hoping to make a core of his operation. Wall Street donors have also expressed eagerness to support Bush if he decides to run. 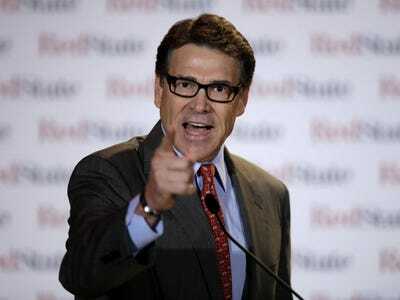 Politico spoke to several donors who expressed hesitancy about backing Perry in 2016. One “prominent GOP bundler” was quoted by Politico saying their support is “frozen” until Bush makes his decision. “I admire Perry, but my first commitment is to Jeb Bush,” they said. In the wake of the midterm elections earlier this month, the 2016 field has been heating up. Former Democratic Virginia Senator Jim Webb officially launched a 2016 exploratory committee on Nov. 19. Hillary Clinton, who is widely expected to be the Democratic frontrunner, reportedly could make a decision whether to enter the fray before the end of the year.